Since it's already confirmed that they will not be implementing my idea of Bogie and Track Elements (or Guidance Magnet and Levitation Rail Elements) to the game where they are both integral components that work together for their function, I guess we the players have to build our own rail technology ourselves using what will be available in the game. 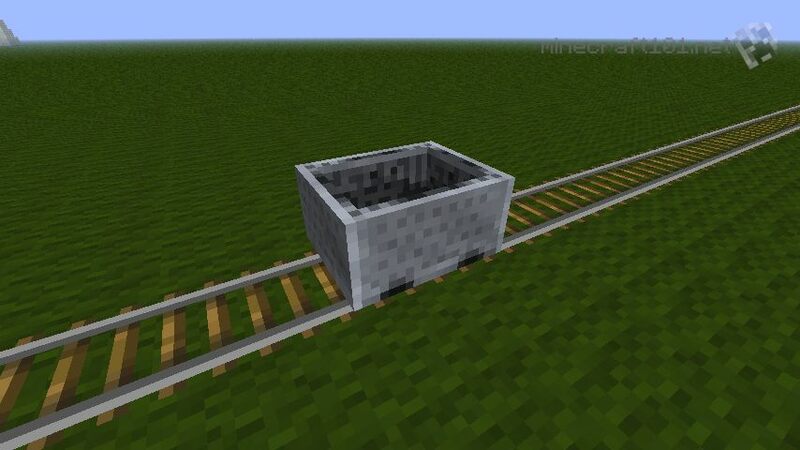 What I proposed before was similar to Minecraft's Cart(the Bogie) and Rail(the Track) Elements. My idea behind this, was since the Bogies and the Tracks are both Elements that already functions together and have their functions, we can go on Build-Mode and build the Cabs (Cars) of the Train on top of those Bogies that functions and moves on the Tracks. There you go, you have a Train! But since we will not be implementing these, I propose Player-made Maglev-like Trains without Wheels. It will levitate on it's own player-made Track and can never be de-railed and has it's own auto-pilot script! It will levitate because underneath the Train are our so-called wheels in the game, the "Hover Engines"! With LUA, Sensor-Elements such as Laser Detection for example, do you still think a player-made auto-piloted Maglev-like Train(with no wheels) that follows the direction of it's own Track is still impossible? I propose that the Hover Engines will be possible to maintain non-varrying distance to the ground even if we have to resort to LUA. 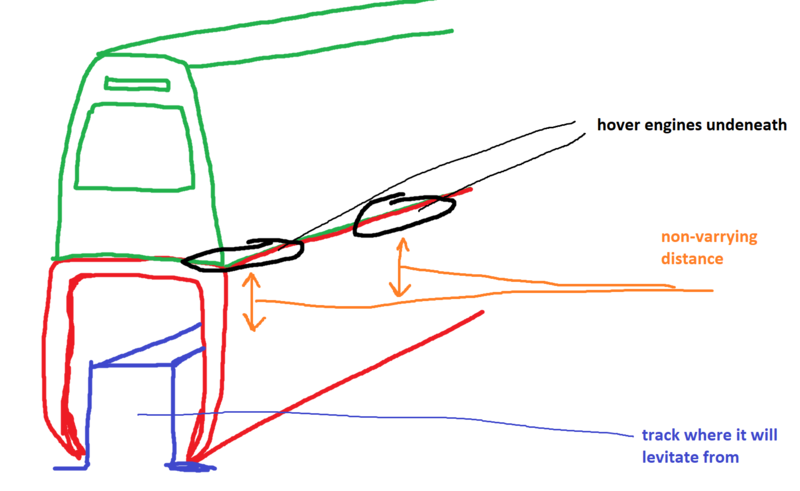 Picture below is non-varrying distance of Hovering to ground. Make this possible even if we have to resort to LUA. Discuss how Maglev-like Trains can be possible and what will be the player-made configuration/s for it! Straight-tracks will definitely be possible. Would it not be simpler to place hover engines downward and on both sides then contain the craft within two rails for this same purpose? Or do you want these to specifically lock on to the rail or source? How about this so it will never derail? Then put Athmospheric Engines facing aft and fore for the forward and backward thrust (once it arrived on the last stop, it will travel to the backward direction and then repeat the process). That will work for a straight trip. Unless we can solve turning, our rail-transportation will have to be configured only for straight trips. For temporary solution till we can solve the turning problems, we have something called "connecting lines". you get off on your stop and you take another train going on a straight trip to another direction. Picture below is just an example illustration of the concept. Reds are the stops. A lot more can be improved on the mapping to make commuting traffic faster and more efficient, but this is just an illustration example of the concept. 1 straight line is 1 train line. you have to take a connecting line (a different train) once you arrived on your stop if you want to go somewhere else. Tracks (each train line) are configured for straight trip, unless we can solve the turning, then only then current configuration can be reconfigured and modernized. In space engineers, in order to achieve a "train" using vanilla mechanics we would need to apply force from all directions against the rail. There are several iterations of the concept but this covers the most common. Personally I think it would be easier to place the train inside a crateled track that is shaped like a U, then use the hover engineers to push against the walls. In SE we are limited to wheels instead of hover designs. free handing in paint for the win! You will build the rails using static cores. in order for them to span for great lengths (and cores are like only hundreds of meters long, for now, as per videos, and is always subject to change), you will place static cores beside each other, linking/connecting the static rails together (use the new Construct Deployment/Moving Tool to align them perfectly). You will use a dynamic core on the train and you will build it on the fixed already-deployed static rails themselves (you will go on build-mode on that dynamic core placed near or on the already-deployed rail. You are building the train on the rail to make sure you are building it with the right measurements in relation to the track and to lock it instantly on the track ofcourse). The track will be composed of multiple static cores (it has to be, because of it's great length! ), the train will be on a single dynamic core that is locked on the track. Just remember to not be too specific, I would hate for NDA to get slapped on this intriguing topic. Yes, the things that I'm covering are all already publicly available information (they are all already available information from Devblogs and Videos). I am keeping the NDA in mind, as always. Thanks for double reminder! No problem, I have seen NDA slapped on things covered in the dev videos though. I even debated a dev about how a publicly know bit of data someone shared on discord was not NDA. After the comment was already deleted, so let that be a fyi. With lua coding we could probably manage to refine the system a little for specific purposes such as turning. In SE there was two ways around "turning", that would either be building shorter in length rail cars or to have a very long bend in the track like real life. Really no way around that. However DU does have gravity shield ramps, it might be possible to extend these ramps over long distances to act as a road or anchor. Just a theory at the moment.